My intention here in this blog, is to document my progress in developing the abilities I have for intuitive drawing and painting. "Development" means interpreting the figures and symbols that come automatically. My friend and highly gifted Britsh medium, Elsie Poynton, says this about mediumship: it is not getting the connection that's difficult, but interpreting the messages received. 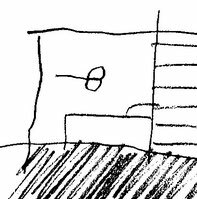 I have noticed that whenever I find myself in a total fog and disoriented whlist sketching, exactly THAT set of lines, that form, so randomly drawn in deep trance moments, indicates the key symbol or most important message in the issue being illustrated. For instance, my daughter was looking for an apartment + came across the perfect offer on the internet. Wanting to know more, I picked up pencil and paper, started sketching the outline of a building and got into "the ZONE". My pencil separated the paper into rooms (imagine a dollhouse) as I slipped and fell even deeper into the ZONE, loosing control. My first reaction as I slip so deeply into mental pergatory is panic. Oopps, I'm loosing track of what I'm doing.... I'm drawing rubbish.... Sylvia!!!CONCENTRATE!!! Upon looking at the form I was embarassed ... looks like a p*nis....what the heck am I drawing??? My very first impression, that my daughter was being cheated was absolutely correct, as we very soon discovered!